I had the pleasure of interviewing Rachel Spencer. She is a Self-Love Influencer, Business Coach, and Instagram Growth Expert. Her story has been featured in Self, Allure, The Today Show, Teen Vogue, and more. Most recently, she was named one of the “Top 50 Influencers Redefining Body Image” by VeryWell, alongside Demi Lovato, Alicia Keys, Kelly Clarkson, and more. Thanks for the opportunity! My story begins back in my early college years when I was struggling with an eating disorder. 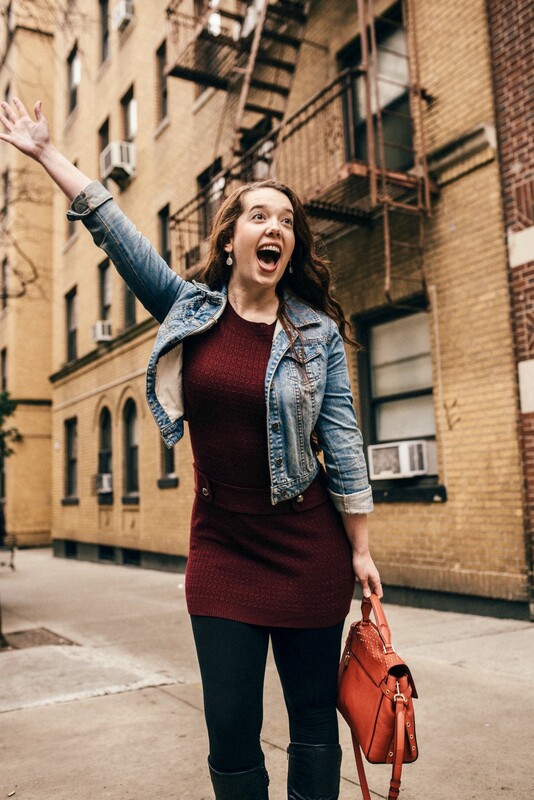 After pursuing recovery and changing career paths(I originally wanted to be an actress, but the pressure to be thin was one of the main reasons I spiraled into my ED and mental health issues) I hired a life coach to help me discover my true passion. During that same time is when I discovered the Self-Love/Body Acceptance community on Instagram. I was so inspired by all of these people vulnerably sharing their stories with the world. It didn’t matter who they were, where they were from, what they’ve done, what color they were, or how big or small they were. Each of them were coming together as one with the same message that we are all worthy of self-love. That’s when I realized I wanted to join them in this movement. I decided to become a life coach myself and specialize in helping women with low self-esteem/body image issues. I never wanted another woman to feel the way I’d felt ever again. After receiving my certification online, I decided I would casually start sharing my story with the Instagram community. I wanted my audience to see my true self and be able to connect with me on a personal level. I started with a simple photo of my cellulite and had NO IDEA how amazing the responses would be. I continued sharing vulnerable stories about my past and eventually, one of them was picked up by HuffPost, Self, Refinery29, and more. By the next day, I was being called by The Today Show for an interview. Needless to say, my social presence blew up overnight and I’d made a name for myself in the self-love community. Fast forward to a few months later, I was booked out with life coaching clients for 6 months and had other coaches asking me for help. “How did you grow so quickly on Instagram? Can you teach me?” That’s when I decided to help other passionate entrepreneurs learn to share their story and start a movement on Instagram. Now, I am not only an influence in the self-love community, I’ve made a name for myself in the business world as well. Funny how overcoming my struggles ended up being such an amazing gift! Can you share the funniest or most interesting story that happened to you in the course of your career? One of my biggest influences is Ashley Graham. I’m obsessed with her confidence and the way she defied the odds becoming the first plus-sized Sports Illustrated model. I’ve been mentioned in a few articles alongside her and I almost faint every time! I always said if she spoke to me or mentioned me on her page that I would just DIE and go to heaven(not to mention a shoutout from her would definitely be good PR)! I bought one of her swimsuits online (check out her brand, Swimsuits for All) and posted a picture, thanking her for the body inclusive brand. The next night I received a notification that she posted my picture along with some others on her main feed!!! My heart pounded out of my chest as I went to take a peek…and what do you know? I was one of the last of the photos she posted and Instagram had GLITCHED, making my photo appear all white. I started laughing hysterically. I wasn’t even mad. OF COURSE. My idol finally posts about me and Instagram decides to hide my photo. I was still extremely thankful that she noticed me and I’ll never forget posting the screenshot of my “beautiful white photo” that Ashley Graham graciously reposted. I always say that no matter how much money I make or how many clients I sign, nothing feels as good as receiving messages about how I’ve changed people’s lives. My favorite message was from a 16 year old girl who said that because of my page, she had the courage to tell her parents about her eating disorder and get professional help. Knowing that I potentially helped save a young girl’s life meant everything to me. I think positive body image starts with US. It’s up to us to show our children and future children how to love ourselves and our bodies. I have a dream of speaking at huge conferences around the country and inspiring women/young girls to fully love themselves. But I wouldn’t be able to do any of this without my coaching career, either. Now that I’m self-employed, I have way more time to focus on the self-love side of my brand. While I’m empowering women to love themselves, my clients are also growing their following and creating massive impact as well. 1. )Don’t be afraid to share your story and don’t be afraid to be vulnerable. Many people see social media as a “highlight reel” but that’s not real life. Having the strength to be vulnerable is a literal superpower. Not only is sharing your struggles extremely therapeutic, the impact it has on others is out of this world. 2.) Know exactly who your audience is and how you can help them. I always say, “If you’re speaking to everyone, you’re speaking to no one.” Have someone very specific in mind and speak directly to them. That’s when your message is the most powerful. 3.) Build relationships. Social media isn’t just about posting and leaving. Answer every comment. Every DM. Watch other people’s videos and stories. Cheer loudly for others. When you truly connect with people, you build that “know, like, and trust” factor that you need in order to impact/sell. Is there a particular person that made a profound difference in your life to whom you are grateful? Can you share a story? Definitely my Business Coach(yes, even Business Coaches have Coaches) Erika Ashley Couto. I was so lost before I began working with her. Not only has she helped me get to a place where I could quit my 9–5 and go full-time with my coaching business, she has helped me become a POWERFUL brand. Within 2 weeks I was being flown to Dallas, Texas to speak at a women’s conference and was booked out with clients for 3 months. So what are the most exciting projects you are working on now? In October, I’ll be re-launching my signature group program, Online Empires, for the 4th time. It’s a 3 month program that helps female entrepreneurs build their business on Instagram through powerful storytelling, finding their unique message, creating a strong brand, and so much more. Graduates of this program have gone on to quit their 9–5 jobs, have the financial stability to travel through Europe, book out their coaching programs, etc. I’m also starting a self-love podcast, which will be released in the next couple months. 1.) If you REALLY want to make a difference and have massive impact, consider becoming a blogger, coach, or entrepreneur. How much of an influence do you really have? Do you think you can truly help people with their personal struggles? Are you curious about creating your own business and sharing it with the people who follow you? If the answer is yes, definitely consider this avenue. I began growing my following before I became a life coach. Then, when I received my certification, I was able to share my expertise with my audience. Luckily, my followers already connected with my message and I was able to be booked out with clients for months. It wasn’t easy, but I’m proof that it’s definitely possible. Check out the International Coaching Federation for coaching programs or Google network marketing opportunities to start. If you love writing, start a simple blog via Squarespace or Wix and see if you can get friends and family to share posts across social media. 2.) A more obvious way to monetize would be working with brands to promote their products on Instagram. Brands LOVE working with entrepreneurs and bloggers who influence a large audience. However, most brands won’t work with you unless you have a certain number of followers. Start by growing your following first and foremost. Eventually, brands will begin reaching out to you to promote their products. You can also reach out to them if you think your audience could benefit from their products, but make sure you send a professional email letting them know how you can serve THEM — not how they can serve YOU. However, my number one piece of advice is to make sure their message aligns with yours. For example, me being a self love and body acceptance advocate, I would never work with a brand that promoted diets or weight loss supplements. It just wouldn’t make sense for me or my audience. Be sure to take that stuff into consideration. 3.) Similar to the above, you can become an affiliate for brands you love. For example, as someone who deals with anxiety, I’ve recently become an affiliate for a brand of CBD oil. I post about them on the regular anyway, so might as well make commission off of the sales from my audience! It’s different from the above example(running ads for the brand) as the brand wouldn’t actively be paying you per post. You’d only make money if your audience buys the product using your code. This can work for any industry — clothing, beauty, lifestyle, etc. If you’re passionate about a specific brand, go to their website and scroll to the bottom. You should see an “affiliate” area where you can apply. Depending on how large your audience is, you could make hundreds, or even thousands, per month on commission sales. 4.) If your audience is large enough, you could actually offer paid shoutouts for other brands and entrepreneurs. I know lots of influencers who offer packages such as: 2 Instagram posts for $100, 1 live video for $50, etc. However, my biggest piece of advice for doing that is to make sure you continue providing value to your audience in between ads. There’s nothing worse than a page that constantly promotes other people and doesn’t nurture their current audience. Continue sharing your story and staying true to yourself. 5.) Know your audience and then get creative! Make art, banners, jewelry, clothing. Something you think is just a hobby could actually become a huge way to monetize. A large market on Instagram is Etsy accounts. They post their products on Instagram and have a link to their site. I have a friend who started selling hand-drawn cards with beautiful watercolors and motivational quotes. She started sharing them “for fun” with her followers and they started asking how they could purchase them. Now, she has a whole separate account where she sells them! Another friend created “worthy and wonderful” bracelets that are now part of giveaways with huge brands. She has a separate account for people to purchase them as well! Anything you LOVE creating can be monetized. Just have fun with it. You have to start somewhere. Ashley Graham! Like I said before, she is definitely my idol and I know that I could learn a LOT from her about business and body love. That would be a DREAM. CALL ME! or if you’re an entrepreneur, you can join my private Facebook group, Inspirational Influencers. We talk all things entrepreneurship and Instagram. I frequently do free trainings and livestreams as well.